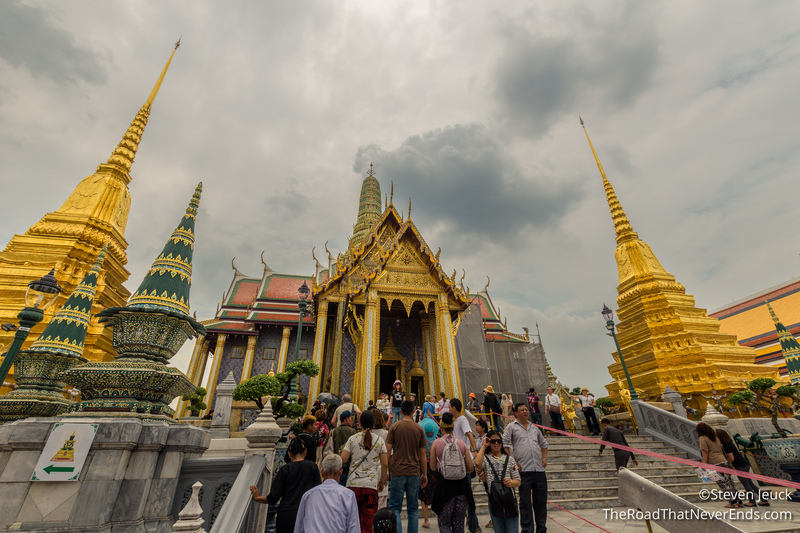 Bangkok is repeatedly on the top destination list of many travel organizations, year after year. 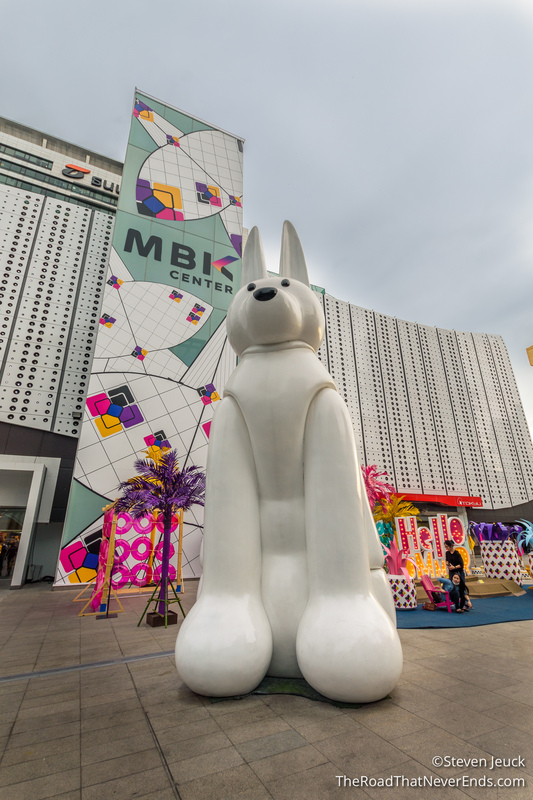 The “Sin City” of Asia offers culture, arts, food, and entertainment for its 8 million locals and visitors. Steve and I had a great time and even though we didn’t see it all (if that even possible) we managed to feel like we got the essence of Bangkok. 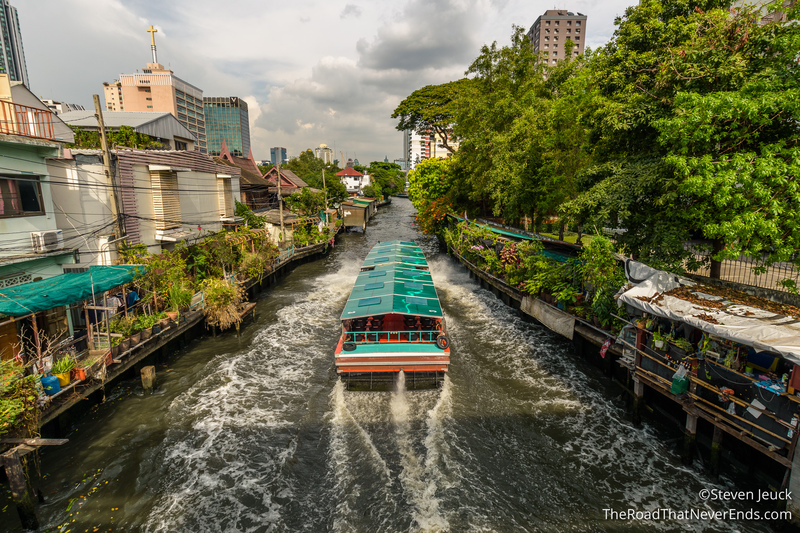 Our voyage to Bangkok was a cheap and interesting one. 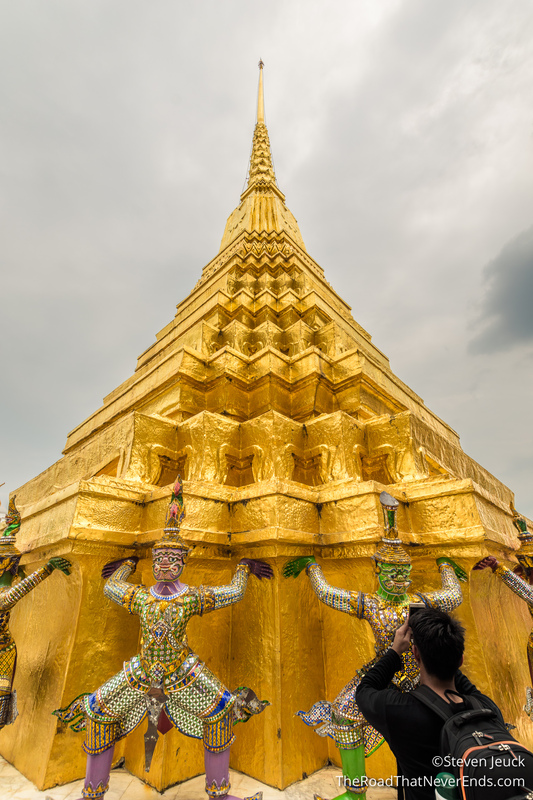 We took the overnight train from Chiang Mai to Bangkok, leaving at 6PM and arriving just before 7AM. We had booked two tickets in second class sleeper with AC on the #10 train. The updated train was very nice. We ended up meeting Nick from San Diego and talked most of the evening. Sleeping on the train was more comfortable than we expected, however still very challenging. The train would stop, make announcements throughout the night and left the lights on. Needless to say, when we arrived at 7AM the next morning we were a bit ragged. 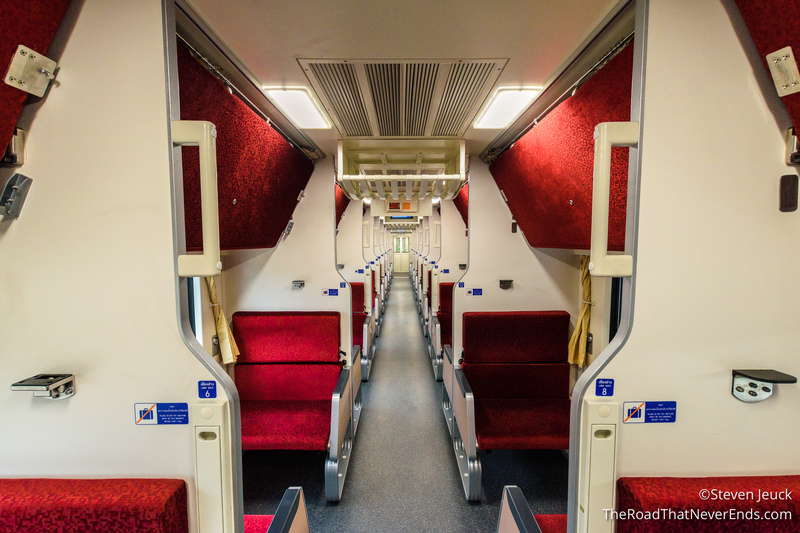 Our advice for sleeper trains is bring earplugs and a sleep mask. 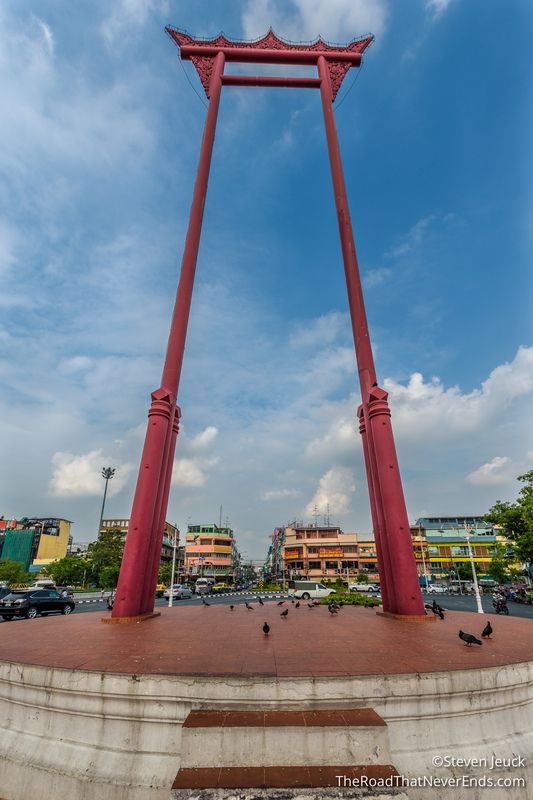 In Bangkok we used two public rail transportations: the MRT, and the SkyTrain. Unfortunately, the two systems do not tie together for payment (like a clipper card), but instead has individual payment systems. 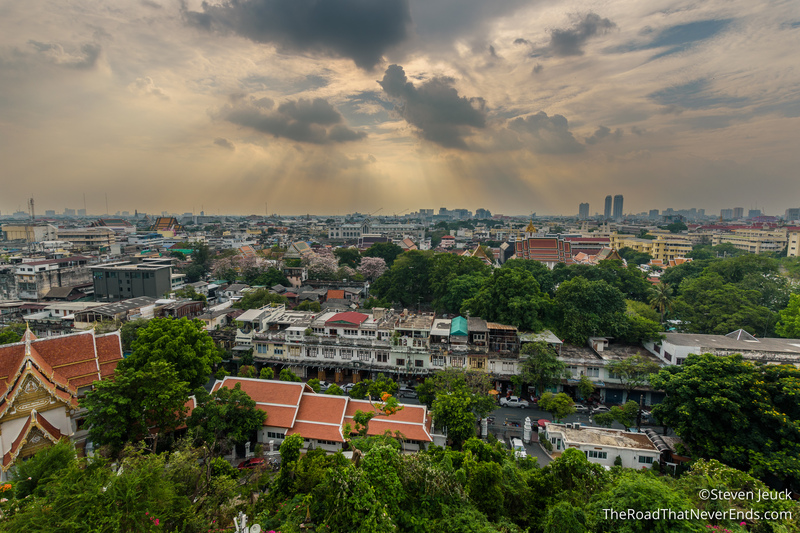 The MRT & SkyTrain also don’t cover the entire city, which made sightseeing on them difficult. We did enjoy using the ferry along the river, for only $0.40! The ferry was packed with people, but proved to be a convenient way to get to several of our destinations and with a view. We stayed at Aim House Hotel. The price was right, and the room was decent. It was within a 10-minute walk to the Skytrain, however, there were no real restaurants (but there was a 7-11 next door!) near the hotel. 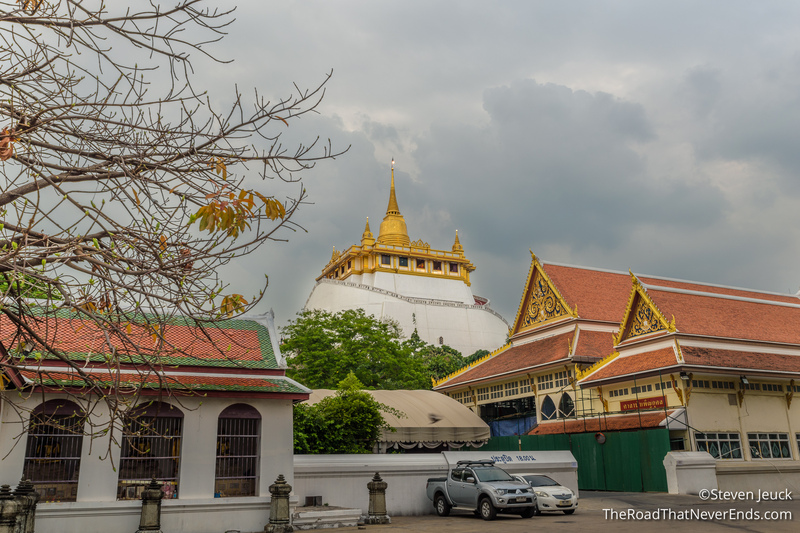 Mall Hopping – When reading what we should do in Bangkok, Mall Shopping kept popping up. Malls here are a hub of entertainment – restaurants, shopping, movie theaters and more. To experience life like a local, you have to visit at least one mall. I understand why they are so popular, Air Conditioning! We ended up spending time in the malls as Steve needed new shoes and shirts. One thing we found peculiar, every time we entered a mall there was a metal detector. This in itself isn’t that odd but the way they were used (or weren’t used) is what makes it interesting. People just breezed through, not taking off bags or emptying pockets. As the metal detector alarms were going off, people were never stopped and neither the security guard nor the patron thought this was out of the ordinary. We followed the norm, and just walked by and smiled at security. We were never once stopped and asked to look in our bags. The only conclusion we have is they want the appearance of security, without the execution. This same practice held true at the major subway stations, where similar “security” was in place. 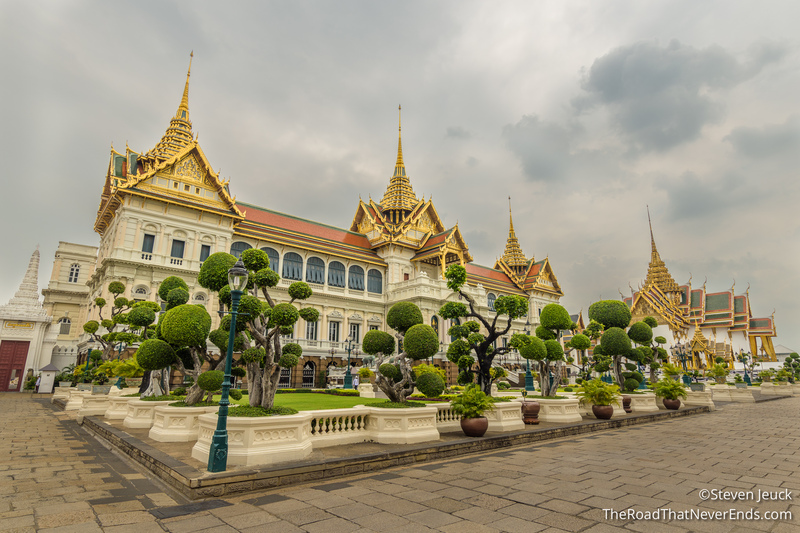 The Grand Palace – I am sure it won’t surprise you that the day we visited the palace, the palace was hosting a memorial for the late King. Getting off the ferry we were faced with crowds all wearing black to attend the service. 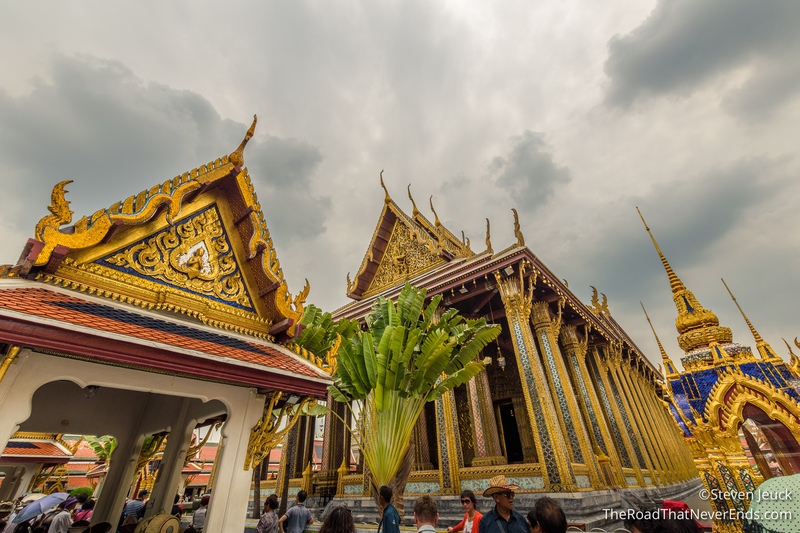 We arrived at 11AM, and found out that the palace was closing at 2PM for the service, and the Temple of the Emerald Buddha was closed to us all day. We also found out that shorts were not allowed for both men and women. I am used to bringing my sarong. Usually the rules are more lax for men, so we didn’t have a spare for Steve, which meant we had to buy another one. 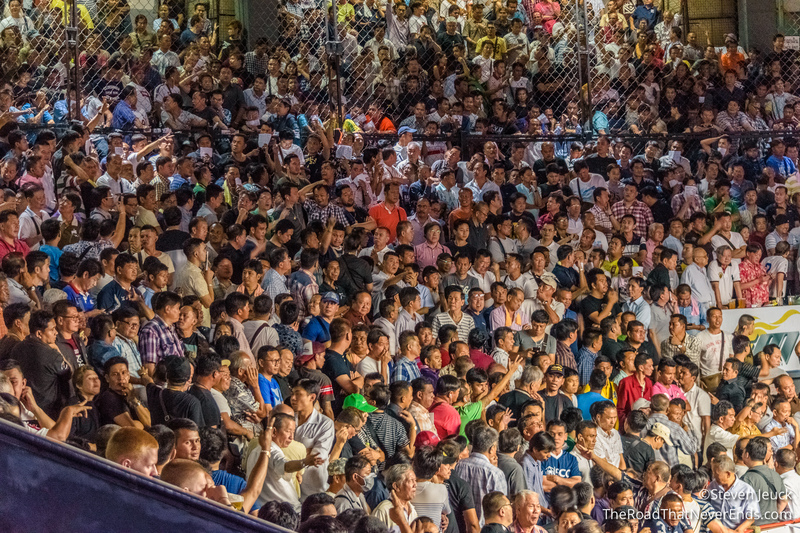 Once getting through security and crowds of people, we bought our ticket for 500 Baht ($15 USD). Short on time, we did our best to get through massive tour groups, tourists with umbrellas and those mindlessly wandering. I can’t blame the mindless wandering. The palace grounds are so spectacular, it’s hard to pinpoint which pretty sight to see first. We spent a few hours here (almost to the kick out time) and felt we were rushed. We were disappointed not all exhibits were opened to us, as they were preparing for the ceremony, but still felt it was time to leave. We were so tired of being in the crowd, that 3 hours was about all we could handle. It is hard to pinpoint our favorite, I can’t stress enough how beautiful the palace buildings are. 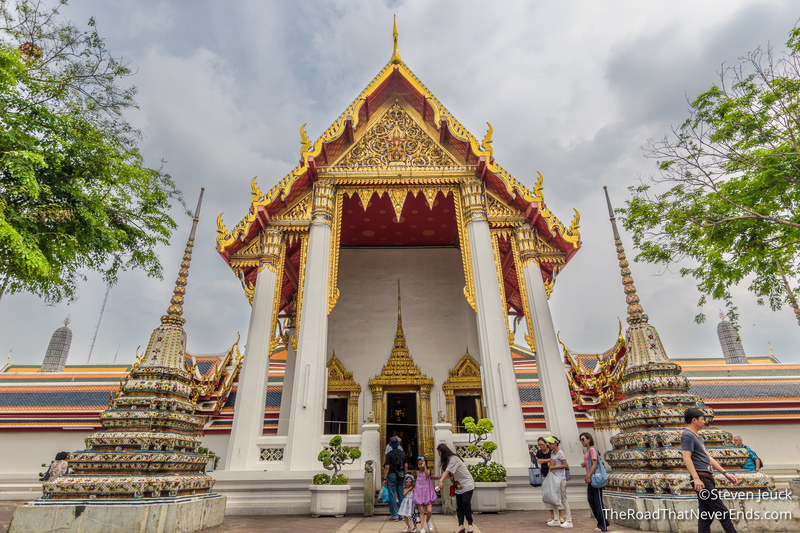 Wat Pho – We had read this is one of the most visited temples in Bangkok, famous for its 46 meter long reclining Buddha statue. 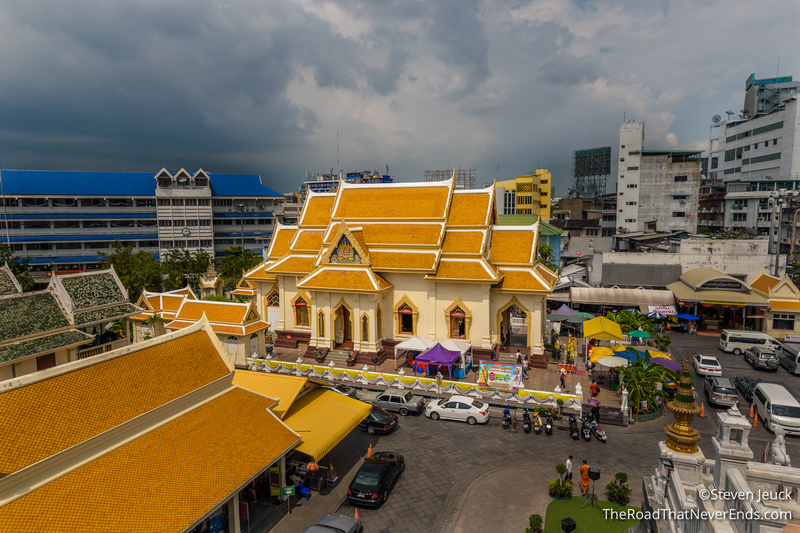 The temple is extremely large (the largest Wat in Bangkok), as it still currently has schools in medicine, and massage. 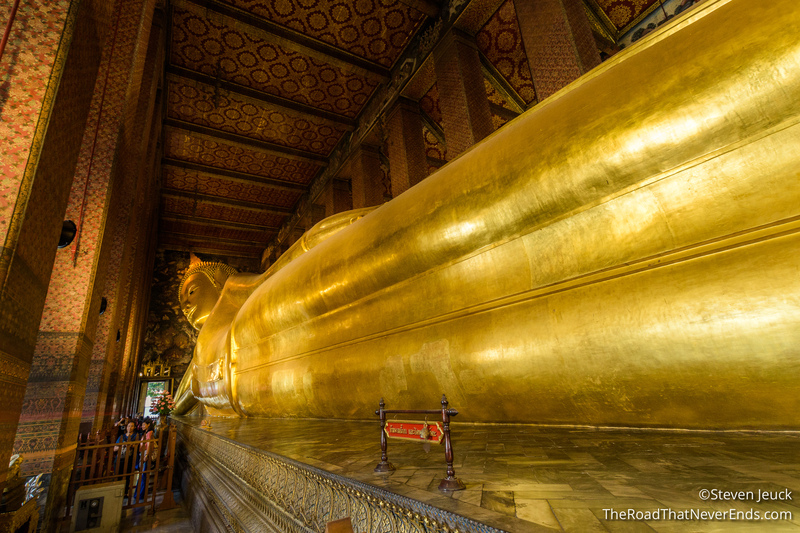 It is where many believe Thai massage started in. 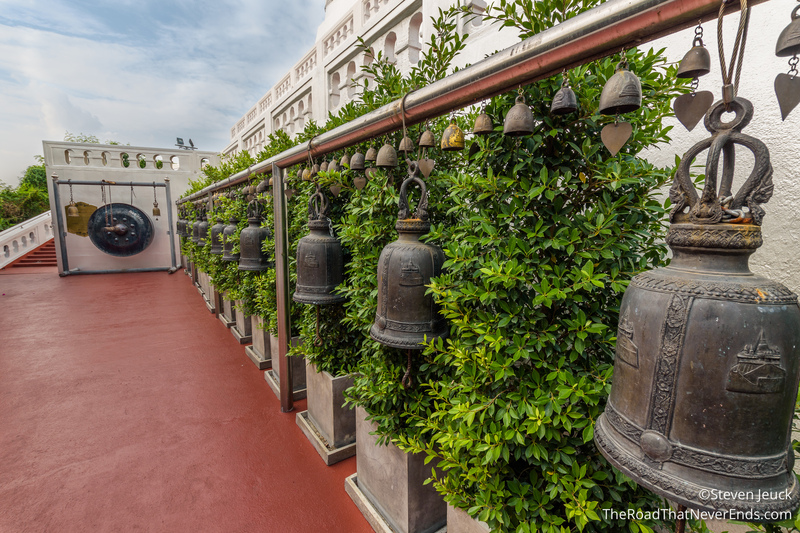 The temple was completed in 1801, making it the oldest in Bangkok. 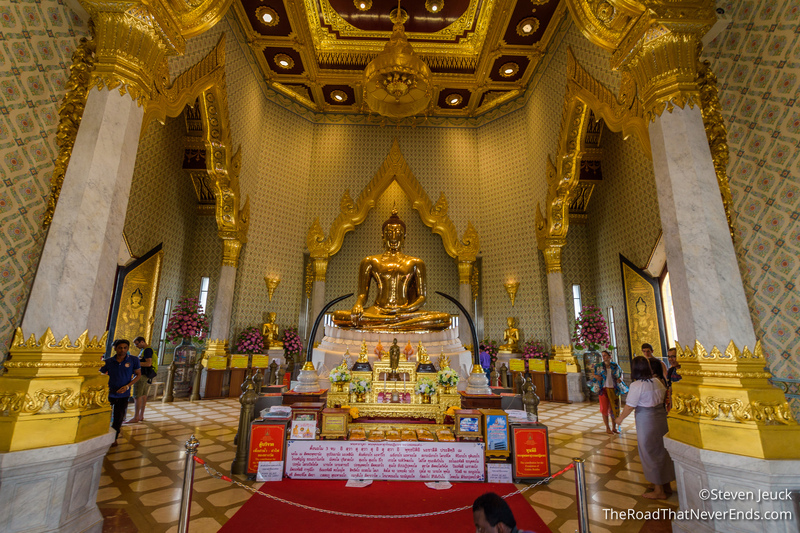 The temple also holds significant importance to the royal family, as many ashes are contained there. The Giant Swing – A bit deceiving, as there is no longer a swing there. The site was used for the Hindu Triyampavai-Tripavai ceremony, but is no longer practiced for safety reasons. The person would swing and attempt to reach bags of coins on top of the pillars. I had read that many people died and/or were injured during this ceremony. 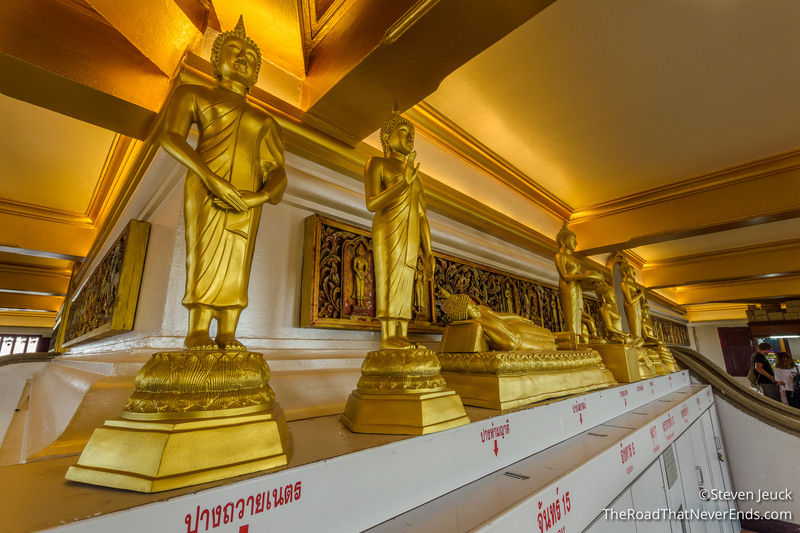 Wat Saket and the Golden Mount – This temple sits on top of a hill, and provides excellent views of the city. The walk up the mount is a quite interesting one, as there are bells everywhere and people tap (or bang) them during the climb and descent. This temple had beautiful displays, including one with vultures that represented the plague that killed thousands. 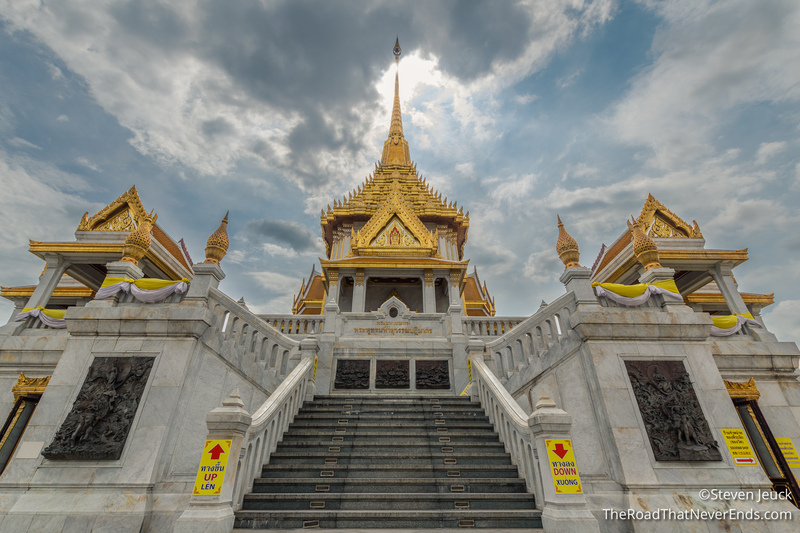 This temple is relatively young, built in the 20th century. 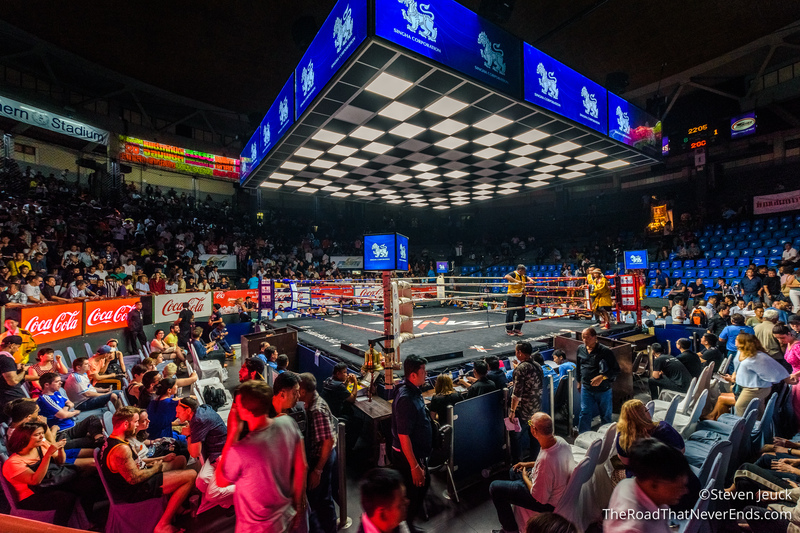 Muay Thai Boxing – I was really excited to check out a night of boxing. If you didn’t know, I really enjoy boxing as a hobby and miss my time at Gladiators. We went to Rajadamnern Boxing Stadium, and bought two tickets in tourist second class. We decided we didn’t want to buy ringside, which would be like $60 USD and instead sat in the upper tourist area for $40. There were 9 matches, with the headliner match as 7th, followed by two youth matches. Besides watching the matches, the whole arena is a spectacle in itself. There is constant betting going on, which we couldn’t figure out their system. The arena sells beer as well as popular colored sugar drinks. I mean everyone was drinking these red, green or yellow drinks. We decided to buy a red one, and it tasted like a very sugary punch. 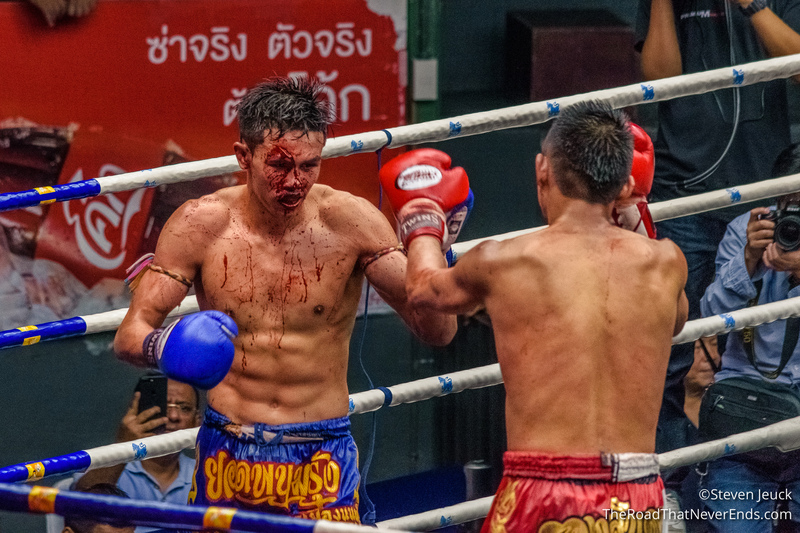 Muay Thai boxing is actually really fascinating, because it is both physical, and spiritual. Throughout the actual fight, music is played. Before the fight begins, each fighter performs a Wai Khru Ram Muay, a dance giving salutation to Buddha, Rama and monks, as well as a dance symbolizing their boxing technique and their trainer. I enjoyed the entire event, and would consider watching it back at home. 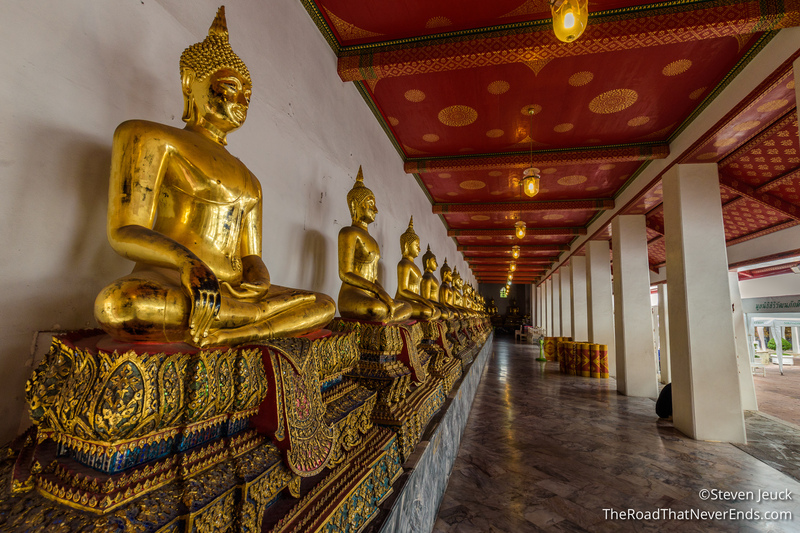 Wat Traimit (home of the Golden Buddha) – The statue has a very interesting history (which you should check out), and is what makes this temple a must see. It is hard to believe, that statue is worth $250 million dollars! It is hard to believe someone had plastered over it (to avoid theft), and it wasn’t “rediscovered” till the 1950s. Beautiful statue. Did I mention – it’s probably from the 13th or 14th century – now that’s old. 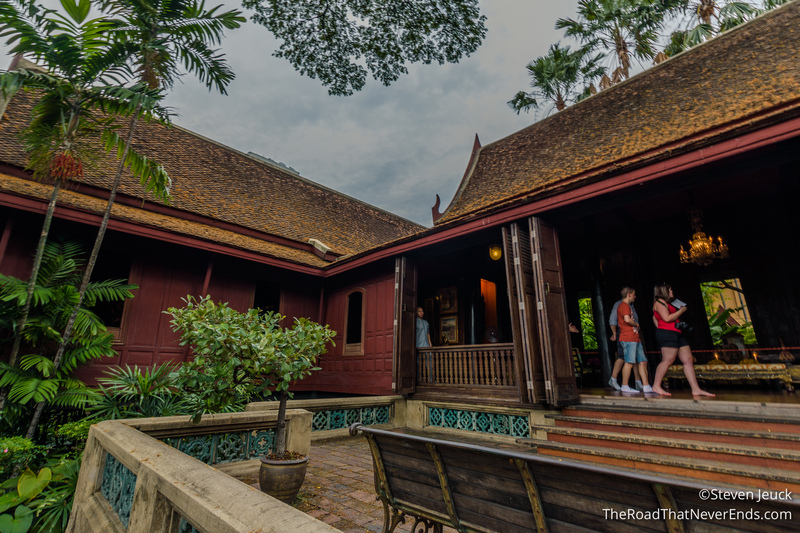 Jim Thompson’s House – Home of American designer, Jim Thompson, who later disappeared. This site is beautiful and fascinating. The house was built in 1959 and is the epitome of Thai traditional housing. Our tour guide was pretty awesome (although, no pics in the house are allowed) and we were pretty amazed by the entire collection of Asian art. We had a great time in Thailand, and Steve’s love of curry alone was a reason to visit. I think as far as returning, it would be low on our priority list. Though we did enjoy our time, we felt that there were too many tourists. If we did return, we would want to check out some more remote islands (with a bigger budget than our current one). Overall, we found the locals to be pleasant, and welcoming. We loved the food, Steve more than me.